North Access – Shaganappi Trail and 16th Avenue. Parking: There are two parking lots one at the south end and one at the north end of the park. As the park is narrow both provide great access to any part of the park. See the map above for the parking lot locations. Gordie’s Review– Throwing rocks in the water! 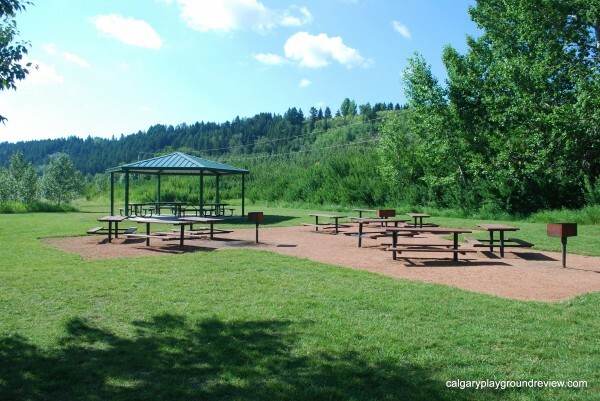 Summer Features: pathways, picnic areas, covered picnic areas, river access, firepits and BBQ stands, gazebos, to the North and East of the park there are off leash areas. Winter Features: Cross country skiing and tobogganing. 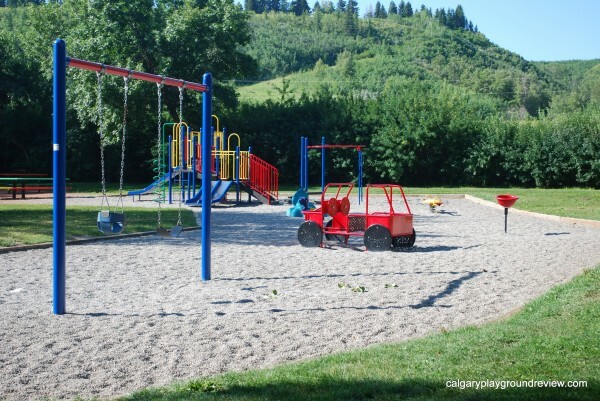 Playgrounds: There are 4 playgrounds in the park. 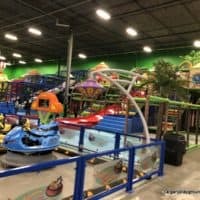 None of them are amazing, but each would be great for the kids to play in while you were having your family picnic. They are pictured below. 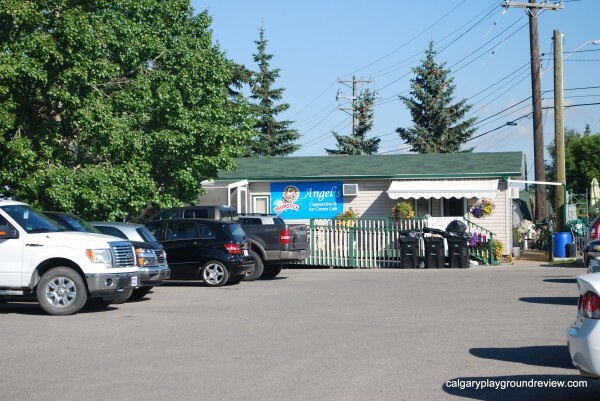 Amenities: Angel’s Cafe at the North of the Park (across the river), washrooms open seasonally. 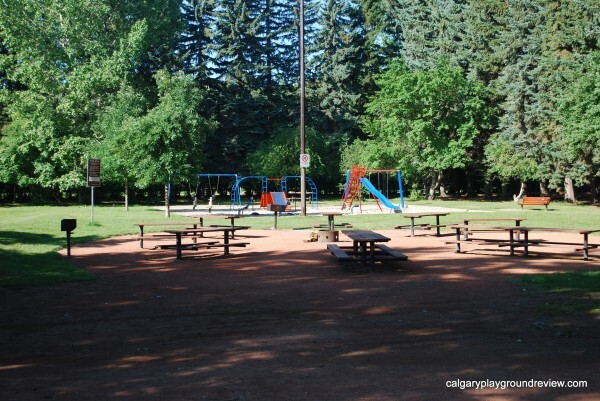 Seating: There are tons of picnic areas many of which can be bookedthrough the City of Calgary website. 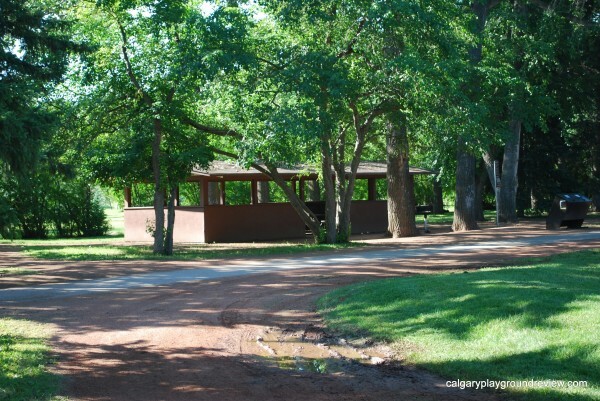 Some areas have a covered picnic area and there are two gazebos that I do not think can be booked. Most picnic areas have fire pits and grills. 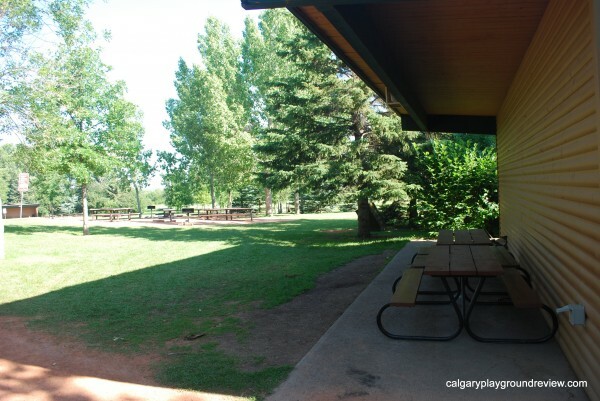 Overall: Edworthy Park is hands down one of the best places to have an outdoor picnic gathering in the city. The picnic areas are plentiful, but there are trees set up so that you can often feel quite secluded from the other groups at the park. This is also a great park for geocaching. 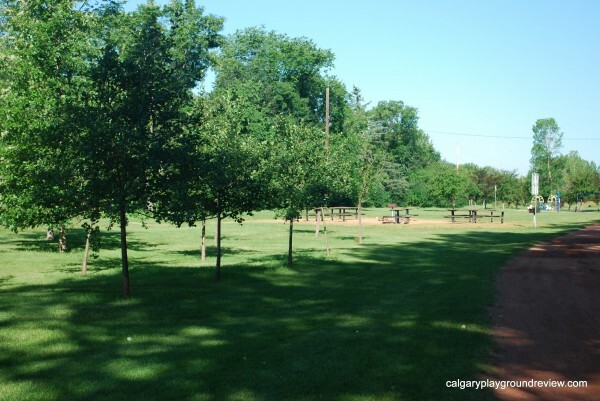 Edworthy Park is a huge park and all the pictures below are from the lower Edworthy area. 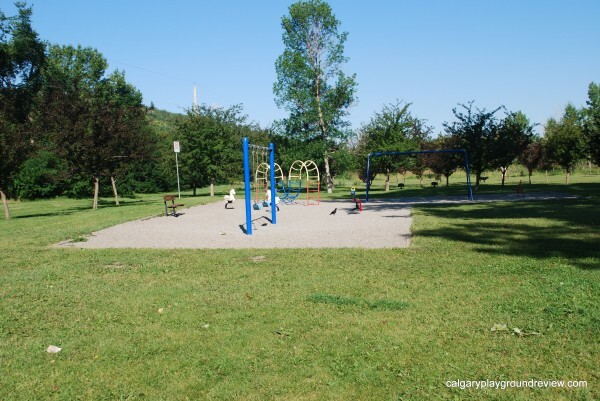 The park also contains the Upper Edworthy area to the South which has hiking trails, an off leash dog park and would be good for nature watching. 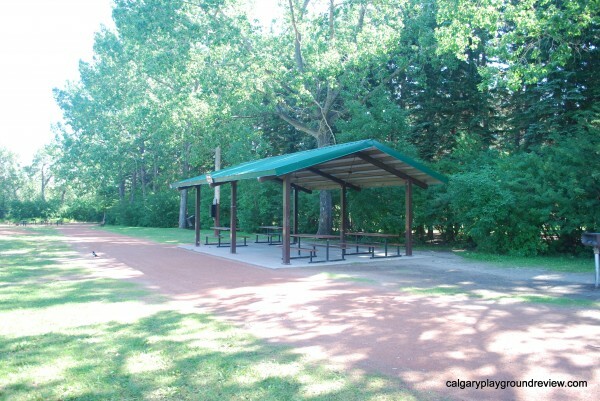 The Lowery Gardens and Douglas Fir Trail are located to the East and are along the Bow River Pathway. There is an off leash dog park and nature watching in this area as well. 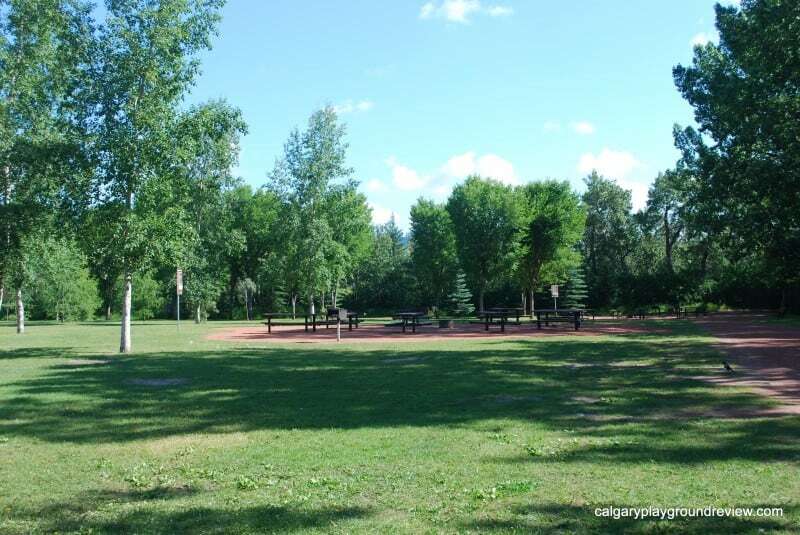 The Lowery Gardens was a market garden when Calgary was young and the Douglas Fir Trail is named for the numerous Douglas Firs along the trail some of which are 350 years old. These areas are much more wild than the Lower Edworthy area. 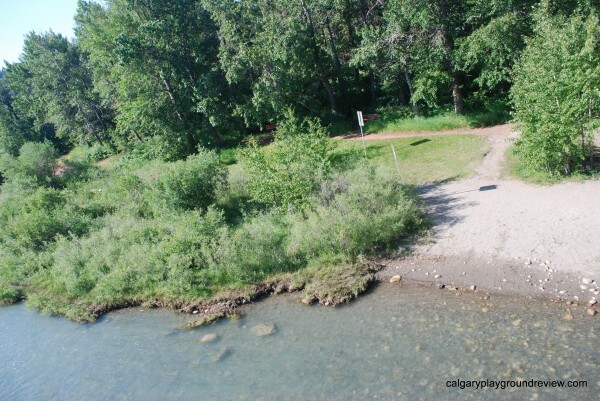 From the North parking lot you need to cross the river to get to Edworthy Park. Angel’s Cafe is located right at the end of the bridge. 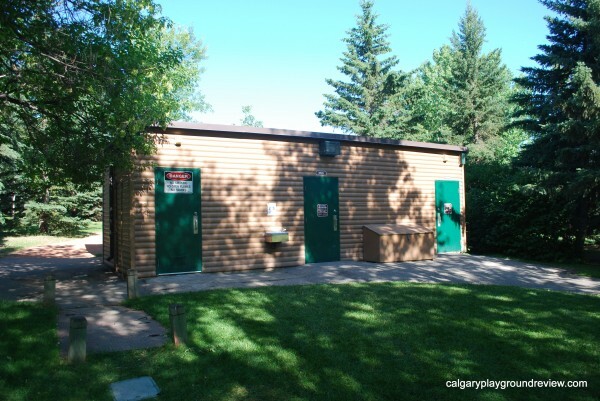 Even though Edworthy park is located right along the river, there is surprisingly few places that you can access or even really see the river. 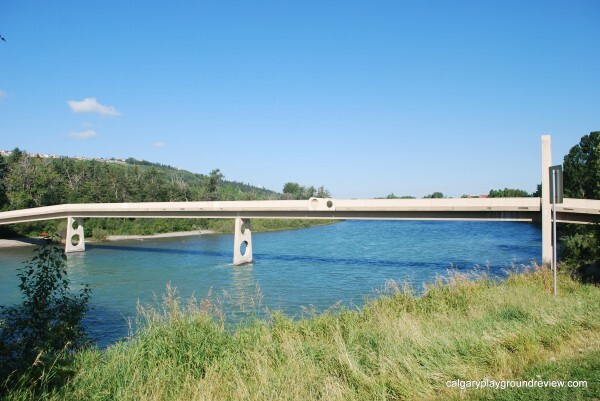 There are two spots (one on either side of the bridge) where you can get right up to the river. The East one (above) is smaller but easier to get to than the west spot. This is a great spot to throw rocks into the river. Playground 1 – the first playground you get to when you cross the bridge. One of the covered picnic tables. View to the West towards Playground 2. 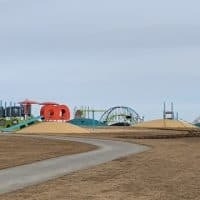 Playground 2 – the furthest playground to the west. One of the uncovered picnic areas. Playground 3 – this is the newest playground in the park. Gazebo by playground 3. 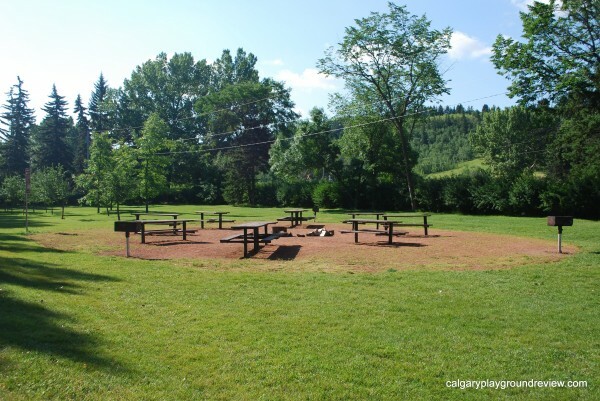 There is a uncovered picnic area right by the playground. The Gazebo is set back quite a bit. 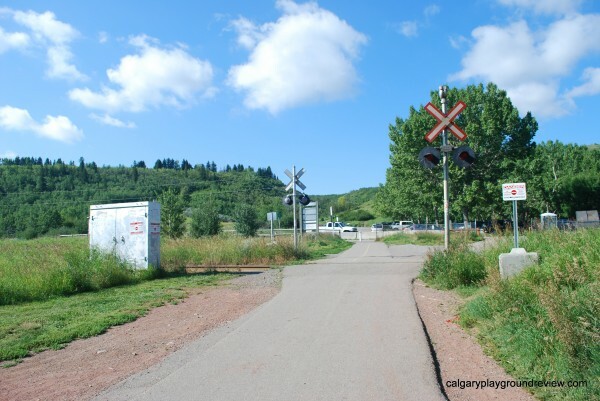 To get to the 4th picnic area and the South Parking lot you have to cross some train tracks. These tracks are in use and if you are lucky you might get to see a train while you’re at the park. 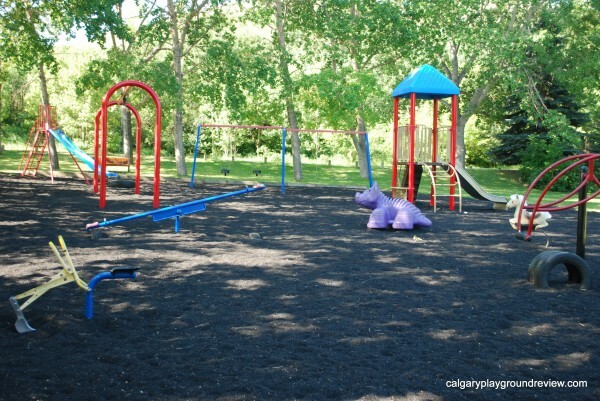 Playground 4 – this playground has recycled tire pebbles instead of pea gravel. 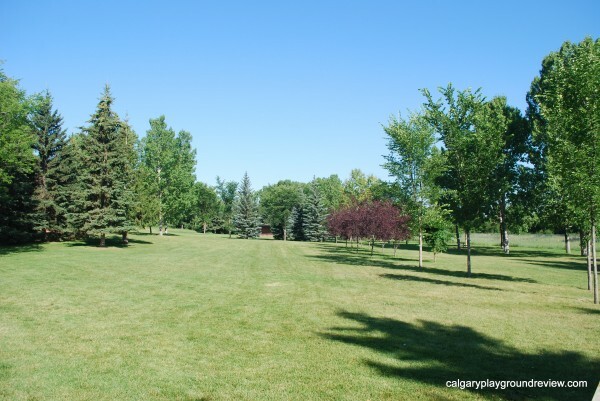 There are quite a number of flat grassy areas like this one throughout the park. Covered picnic area by Playground 4. 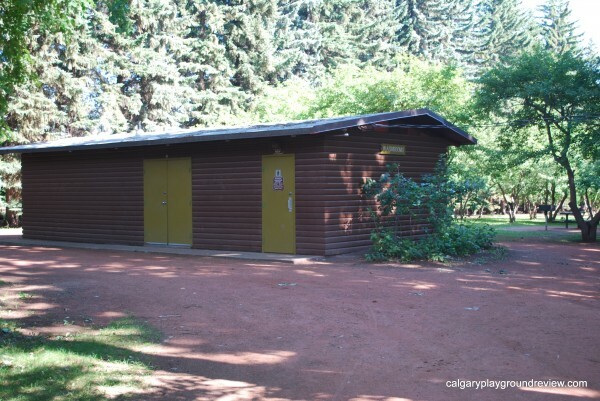 It faces away from the playground and is on the other side of the washrooms. 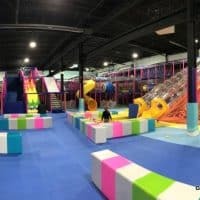 Give this place a pass if it is a weekday. The north parking lot was 100% full, complete with people parked along the access roadway, by 8:45 am. I assume people leave their cars there and commute to work or school, and there is no parking time limit. 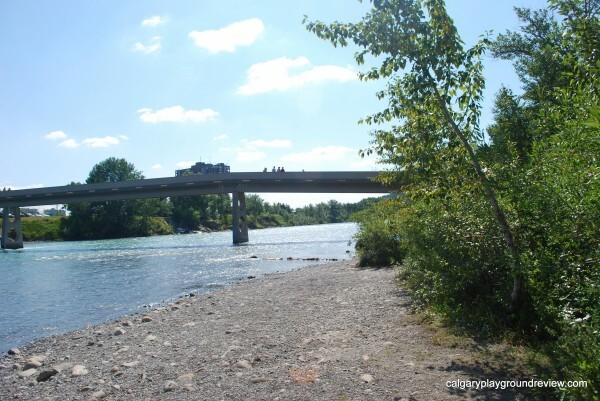 Thank you for the great photos of the picnic sites. 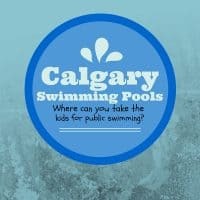 You have better information than even the City of Calgary website.